That morning, three of us woke up early – earlier than most people visiting New Orleans – and drove to a rural area not far from Rayne, LA. A local woman there had asked Cherri to come and monitor the pipeline work being done. We came to assist. The property is long – long enough that it is already home to five pipelines. Yellow marker poles run nearly the entire length, and now mud pits and excavators mark the placement for a sixth pipeline: the Bayou Bridge Pipeline. “I brought a book,” Cherri says, digging through her bag. She pulls out James Baldwin and flips through a few pages before getting pulled back into conversation. She jokes about a recent phone call where a man appeared shocked by her eloquence and depth of knowledge. “What was he expecting?” she says laughing, and adopting a caricatured Native accent. “Huh – we no want pipeline.” Much to the chagrin of officials and members of industry alike, Cherri Foytlin is neither simple nor delicate. Her and her fellow water protectors manage to monitor and stay on top of both Energy Transfer Partners (ETP), the company behind the Bayou Bridge Pipeline, as well as the pipeline construction itself. And they do this without anything like the massive government-sponsored surveillance network that’s being used on them – at their homes and at the resistance camp, L’eau Est La Vie. In the most oil-friendly state in the country, putting yourself and your life directly in the path of a gigantic pipeline project is no small matter. When that project belongs to one of the most violent and destructive companies in a violent and destructive industry, the obstacles are even bigger. The Bayou Bridge Pipeline is a 162-mile proposed crude oil pipeline that would connect the oil from the Dakota Access Pipeline and the shale oil fields of North Dakota to the refineries in the Gulf. ETP, the same company behind the Dakota Access Pipeline, has already shown the world what they’re willing to do to push a pipeline project through: attack unarmed protesters with dogs, tear gas, rubber bullets, concussion grenades, high pressure water hoses in subzero temperatures, and heavily armed private security. TigerSwan, the private security company who used military style counter-insurgency tactics at Standing Rock, is currently appealing a decision in order to get a license to operate in Louisiana. ETP CEO Kelcy Warren remarked at a conference in March that pipeline protesters should be “removed from the gene pool.” ETP’s panache for violence is not restricted merely to people, however. ETP’s parent company, Sunoco is also famous for spilling more crude oil than any other company – with more than 200 leaks between 2010 and 2016. ETP is apparently on a mission to keep that number one spot, logging five spills in the first six months of Dakota Access Pipeline’s operation. The ETP Mariner East 2 project in Pennsylvania is still under construction but has already wreaked havoc on both people and ecosystems along the proposed route. Last year, FracTracker reported 90 different spill events in 42 distinct locations amounting to 202,000 gallons of leaked drilling fluids. In January of this year, the PA Department of Environmental Protection suspended ETP’s construction permits citing permit violations which included even more spills and horizontal directional drilling at sites they had no legal right to drill at. About a month and $12 million later, ETP got the go-ahead to carry on with construction. In March, ETP’s existing natural gas liquids pipeline, Mariner East 1, was temporarily shut down due to the emergence of numerous sinkholes along the pipeline route. Meanwhile, ETP’s proposed 713-mile Rover Pipeline has been equally disastrous. Worked stopped in April of 2017 following a 2 million gallon drilling fluid spill, but was allowed to pick back up again in December of 2017. In January of this year, another 150,000 gallons of drilling fluid spilled in the same exact site of the April spill. The pipeline, slated to carry fracked gas through Pennsylvania, West Virginia, Ohio and Michigan has already racked up more “noncompliance incidents” than any other interstate gas pipeline. Still, Louisiana officials and the Army Corps of Engineers feel the Bayou Bridge Pipeline is worth the risk to both people and planet. Their primary argument: economic benefit for Louisiana. On March 1st, a coalition of groups held a press conference at Governor John Bel Edward’s office in Baton Rouge. Anne Rolfes, founding director of Louisiana Bucket Brigade asked fellow speakers from along the proposed route of the pipeline to hold up images of license plates. The numbers were blurred but the state names were clear: Tennessee, Texas, Alabama, even Utah. The pictures were of construction vehicles at sites along the Bayou Bridge pipeline route, Rolfes explains. “The only rationale for this pipeline has been that it’s going to create jobs,” she says. But between out-of-state construction workers and the admission by the company themselves that the project will only create 12 permanent jobs, the promised economic gains for Louisianans seem to be nothing more than a pipe dream. Travis London, a resident of Louisiana petrochemical hub Donaldsonville and spokesperson for the H.E.L.P Association of St. James Parish, explained the real “gifts” from big industry. “The economic situation in Louisiana is awful. The pollution is killing Louisiana’s tourism, the hunting, the fishing, workforce, education….just everything…Upcoming small businesses don’t get tax exemption, but industry does…Ain’t enough jobs created. Ain’t enough opportunities here. Ain’t enough faith in most Republicans or Democrats either. There are more industrial plants in Louisiana than ants in an ant pile.” Indeed, a report released in February of 2016 by the Environmental Integrity Project shows that in 2015 alone, seven LNG facilities were proposed or permitted along with two natural gas processing and distribution plants, five fertilizer factories, five chemical plants, and a petroleum refinery. According to the report, these projects boosted Louisiana’s emissions by 30%, taking the already high World Resource Institute estimate of about 230 million tons of greenhouse gases to roughly 300 million tons. The report warns regulators to be “vigilant in monitoring and controlling” the existing and new emission-heavy projects. Unfortunately, regulators appear either unable or unwilling to keep new and existing projects in check. At another press conference held at Governor Edwards’ office in Baton Rouge on March 21st, the H.E.L.P. 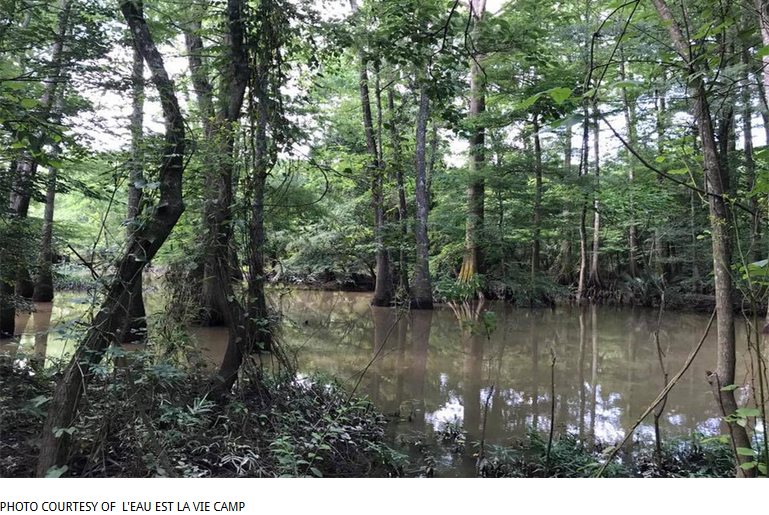 Association of St. James, Louisiana Bucket Brigade, L’eau Est La Vie Camp and 350 New Orleans released a report outlining spills and accidents in St. James Parish between January 1, 2017 and February 25, 2018. St. James Parish would be the end point for the Bayou Bridge Pipeline and is already home to plenty of unstable energy infrastructure. In that time period, 37 accidents were reported to the National Response Center (NRC). The report goes on to say that this number is actually deceptively low as the NRC expects industry to self-report. Furthermore, there’s “not a single instance of an industry report corresponding to a neighbor’s complaint, meaning that there are at least eight occasions ‐ and likely far more ‐ in which industry failed to report an accident.” Industry in St. James also routinely fails to notify residents of harmful situations. On March 4th, 12,558 gallons of crude oil spilled from a storage tank belonging to the Plains All American Pipeline. Despite the possibility of an underground leak, residents were not contacted or cautioned and there was no follow-up by regulators or industry. In one week, there were two ammonia spills and last month, an oil barge spilled oil into the St. James water system. Meanwhile, residents already suffer illnesses ranging from miscarriages to nausea. Pollutants have been found in the air, soil and water, and chemical odors can linger in neighborhoods for days or weeks at a time. “The point is to say that our state clearly cannot handle the existing infrastructure in St. James Parish so we shouldn’t put any more there,” Anne Rolfes explained. It starts to rain. Cherri hands us a couple of umbrellas and we stand and watch the construction continue – even though it’s supposed to stop during rainy weather. Later that evening, my friend and I stop to watch the sun set over crawfish ponds. There is paradise around the dug up ditches, between the lines of destruction. When you see it – really stop to look at it – it’s easy to know why the fight will always continue. You begin to see why in that present fight, we build for the future – why L’eau Est La Vie Camp is growing food and teaching kids about permaculture and food sovereignty. You begin to see that this isn’t about stopping life to do battle. The battles fold into life. Life on the front lines of capitalism’s battles is a fiddle and ukulele duo serenading the camp cat while she chases gnats. It’s watching stupid YouTube videos in our tent before falling asleep. It’s rigorous planning across 160 miles of proposed pipeline. It’s coordinating different groups from different backgrounds with different ideologies. It’s holding space and blocking work. It’s taking direction from indigenous women and recognizing a 500+ year history of colonization, now embodied by earth movers and colored flags marking pipeline easements. It’s waiting – and watching. It’s trying to figure out how we on the left can do better than just theory and talk. For instance, can we create an action force for various areas of the country that’s ready to deploy in times like these? To support the battles and the life inside them? Can we stare down our time and our place and say “I am not afraid.” Folks in Louisiana are – and they could use your help. Our environment is already taking lives. The next big war I believe will be over water. Without it there is no life. People are all ready dying from contaminated water or NO water. As the earth around us withers and dies? surrounded by plastic made from oil, ripped from the ground. would make it all better, could reinvent time. perhaps I must give up my heart and my soul! In time, without man, will come a rebirth. Let us blame money for every problem. The concept of money is one massive, man-made delusion. It is a simple fact that money is not a product of nature. What are the key products of nature? Science and Technology. Money has evolved into an artificial computerized structure of 1s and 0s, which have become extremely harmful to humans and nature. The concept of money has made humans so heartless, that we don’t even share the artificial numbers with the poor to end poverty. This outlook produces a bitter fact: Viewing the world through the eyes of capitalism makes our species delusional, unintelligent, and heartless as the foundation of our existence. Does that not describe most politicians and corporate leaders, even though they profess to be intelligent and caring? In reality, they are neither to the big picture of humanity because they do not understand the proficiencies of technology in its best configuration. The education of capitalism has fully distorted science and technology. Viewing the world through the eyes of a Resource Based Economy is a higher level of intelligence and morality since the focus is on the whole of humanity. The view recognizes that money is unnatural but graciously needed as a temporary engine. If the science community applied a humanitarian configuration of technology and automation, we could address our social ills through technical systems which over time removes the concept of money. A community grid of highly advanced automation supplying the needs of every human would put an end to corporations, governments, war, poverty, and famine. Humans on a wide scale will experience real freedom. So, when our politicians say they are fighting for freedom – from a RBE point of view – no, …they are not. They have no idea what constitutes real freedom. The intelligence is lacking and their hearts are not strong enough to care for all of humanity. The same could be said of our corporate leaders. Fundamentally, the average human has become imprisoned by the heartless and delusional minds who manage the world through money. Science and technology coupled with automation can do a near perfect job. You answer the question of why that is true. Exactly how much oil per capita will replace fresh drinking water? And what the hell will they do with it when there is another 17,000 (or larger) gallon leak? What the money-hungry bastards destroying our planet don’t get is that all that money and power won’t do anyone any good once the planet is incapable of supporting human life. Or, maybe they get it, but just don’t care. After all, the one truth that they do know is that they won’t be here when that happens. PS, please take me off your FB block list.